Unskilled migrants should be stopped from moving to Britain for five years to help reduce net migration, a report by a pro-Brexit group has said. Leave Means Leave, which is backed by senior Tory backbenchers, says the measure would help get net migration below 50,000. It is currently running at 273,000 a year. Anti-Brexit campaigners said such a move would cause skills shortages that would damage business and the NHS. Leave Means Leave wants to combine the Australian points-based system with plans for work permits which would come into force after the UK has left the European Union. 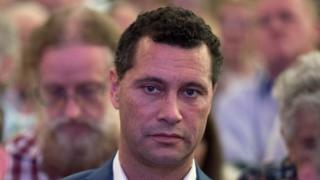 The report is authored by independent MEP Steven Woolfe, who quit UKIP following an altercation with a colleague that left him in hospital. In a speech on Monday, Mr Woolfe will say: "We need an immigration system that is fair, flexible and forward-thinking. "It must be fair in its outlook, flexible in practice and forward-thinking for our economy. "Brexit is not about splendid isolation - it's about re-engaging with the world, without our wings clipped by the European Union." But he said introducing "strict controls, an annual cap and a five-year freeze on unskilled migrants" would "reduce net migration year-on-year, lessen the strain on our public services and help build a more cohesive society". Asked on Sky News about claims his plan would deliver a huge blow to the UK economy, he said that view was based on the idea of a mass exodus of migrants which he did not believe would happen, adding that his plan would lead to a more gentle reduction. Conservative former Cabinet minister Owen Paterson, a member of Leave Means Leave, said the "overwhelming majority of Britons feel absolutely no resentment towards workers or students from overseas". But he added: "Mass migration at its current level has fostered resentment, depressed wages and placed an excessive burden on our public services." The report was condemned by members of the cross-party Open Britain group. Conservative MP Anna Soubry said: "We have seen encouraging signs from the prime minister that she accepts and understands the reality facing British business - they will continue to need overseas workers for years to come. "Migrant workers contribute to our economy and to British culture - we should be welcoming them in the traditional spirit of British tolerance. "Leave Means Leave clearly don't understand why British business relies on migrant workers." Labour's Pat McFadden said the prime minister faced a choice between going "down the road advocated by this kind of plan" or taking a "more realistic and honest approach to the Brexit negotiations on immigration and other matters". Under the Leave Means Leave plan, there would be no cap on highly skilled workers, entrepreneurs or investors but unskilled visas would be halted for five years. Work permits would only be granted if the applicant had a job offer with a minimum £35,000 salary and had passed an English language test, signed a five-year private health insurance contract and had savings in the bank. Up to 50,000 temporary work permits would be issued initially for agricultural workers, tapering off to zero by the third year. There would be no restrictions on the numbers of students who wanted to head to the UK. Exemptions would be made for health workers if they were needed from overseas but the report says the focus should be on increasing the number of Britons working in the medical profession. EU nationals already settled in the UK would have the right to remain indefinitely as long as Brussels adopted the same approach to UK citizens living in Europe, the report says. But the government should immediately announce a cut-off date for when new arrivals stop qualifying, it added.